The dry season can last over 6 months in Nandom and Lawra, two districts of the Upper West region of Ghana. During these long dry spells, farmers struggle to irrigate fields and provide food to the local communities. Past research efforts on water management in the region have failed to reach the local farmers and communities with knowledge and resources. 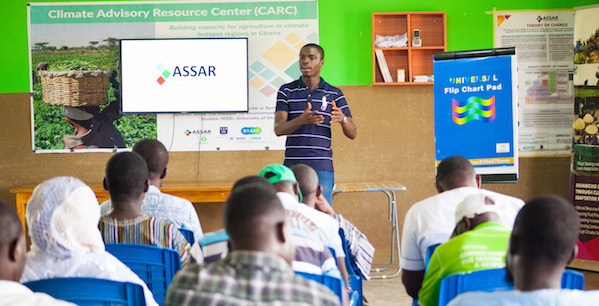 Starting from this reflection, the Ghana team of the Adaptation at Scale in Semi-Arid Regions (ASSAR) program, with START’s support, decided to adopt a new approach to bridge the gap between researchers and practitioners. “When we started engaging with the local stakeholders, many expressed frustration for not having access to findings and resources from past studies. 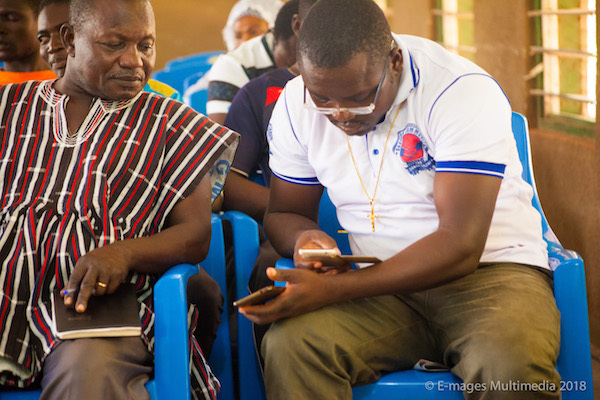 The few communications efforts that had been made were not adapted to their needs: for example, a project produced printouts that farmers never used,” explains Prince Ansah, Technical Officer with ASSAR Ghana. “So, we made it our priority to think innovatively about how to engage stakeholders, and to make findings available to those who need them most, in the most convenient way” adds Prince. Prince’s team brought together for the first time farmer groups, agriculture extension officers (intermediaries who relay latest agriculture knowledge and technologies to the farmers) and agriculture input dealers (people and organizations selling agricultural products and equipment) to identify opportunities for improving water management during the dry season. The discussions, facilitated using the participatory scenario planning (PSP) process, led to the development of platforms that will enable farmers to access resources, including loans and technical assistance, in an easier and more structured manner. They also led to the establishment of four climate advisory resource centers (CARCs), in collaboration with the district’s Department of Agriculture. Adaptation Hub was developed in partnership with VideDesk, a startup based in Accra, and the content was provided and reviewed by institutions such as the Ministry of Food and Agriculture, planning offices of district assemblies in Nandom and Lawra, the Nandom Dinery Integrated Rural Development Partners (NANDIRDEP), and the Climate Change Office of UNDP, Accra. Stakeholders trying out the Adaptation Hub mobile application.